Palak Matar Corn Sabzi is a healthy combination of green vegetables like peas, corn and spinach made into a sabzi. It is a nutritious sabzi for vegetarian food lovers. 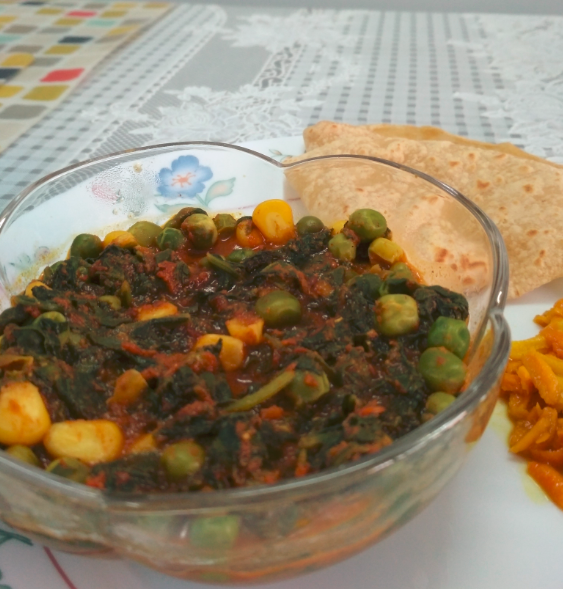 Palak Matar Corn Sabzi is a delicious sabji made from Spinach (palak) , Peas (matar) and boiled corn. 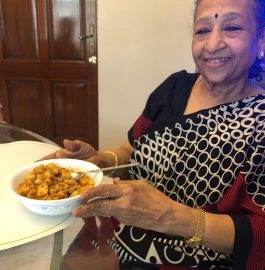 It is very easy to make and a great accompaniment to roti/phulkas/rice. Palak Ka Paratha – Delicious And Healthy! In a pan, add oil, cumin seeds. Once they start popping, add tomato puree. Stir it to combine well. Cover it and let it cook for 2 minutes. To the tomato puree, add palak. Cover and cook for 5 minutes. Keep stirring in between. To this add turmeric powder, garam masala, red chilli powder, coriander powder, salt and mix well. Add 2 tablespoon of water if it is too dry. Let it cook for few minutes and add green peas(mutter) and boiled corn. Let it cook for 2 minutes. Palak Matar Corn Sabzi is ready to be served with roti or rice.